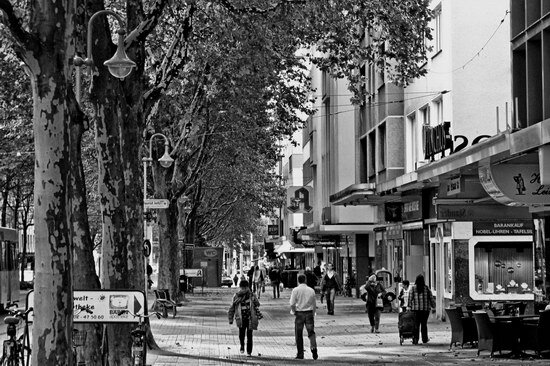 The right, or better north side of Mülheim’s Leineweberstrasse, which was made into a wide pedestrian area in the 1980s. Like on the parallel running Schloßstrasse, many shops have closed and the once busy shopping street is only a shadow of its former glory. Halfway down, there’s at least one reason to still go in this direction: Mülheim’s only dedicated tea shop in the inner city, which you can see in this photo if you look close enough.